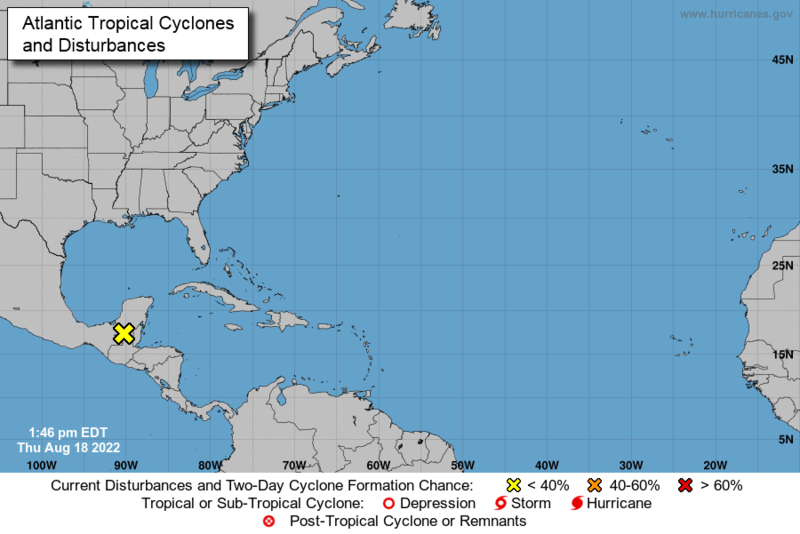 View the latest tropical information from the National Hurricane Center. Please click on the images above to update. STORM SURGE - A hurricane can produce destructive storm surge, which is water that is pushed toward the shore by the force of the winds. This advancing surge combines with the normal tides to inundate normally dry land in feet of water. The stronger the storm, the higher the storm surge. INLAND FLOODING - In the last 30 years, inland flooding has been responsible for more than half the deaths associated with tropical cyclones in the United States. HIGH WINDS - Hurricane-force winds can destroy poorly constructed buildings and mobile homes. Debris such as signs, roofing material, and small items left outside become flying missiles in hurricanes. TORNADOES - Hurricanes can produce tornadoes that add to the storm's destructive power. Tornadoes are most likely to occur in the right-front quadrant of the hurricane. Graphical Hurricane Local Statement: Issued by local National Weather Service offices to provide more specific information about potential impacts of a tropical storm or hurricane on a particular area. When a HURRICANE WATCH is issued, it means that hurricane conditions are possible within the watch area. The hurricane watch is issued 48 hours in advance of the anticipated onset of tropical-storm-force winds. This watch should trigger your family's disaster plan, and proactive measures should be initiated especially those actions that require extra time such as securing a boat, leaving a barrier island, etc. When a HURRICANE WARNING is issued, it means that hurricane conditions are expected within the warning area. The hurricane warning is issued 36 hours in advance of the anticipated onset of tropical-storm-force winds. Once this warning has been issued, your family should be in the process of completing proactive actions and deciding the safest location to be during the storm. Build a disaster supply kit and have a family and/or business plan. Remember to also have a plan for pets.